Well I have 95% of everything I now need. Just need to finalise my ‘sock solution’, little more food and documentation. I have divided up my equipment into two groups. 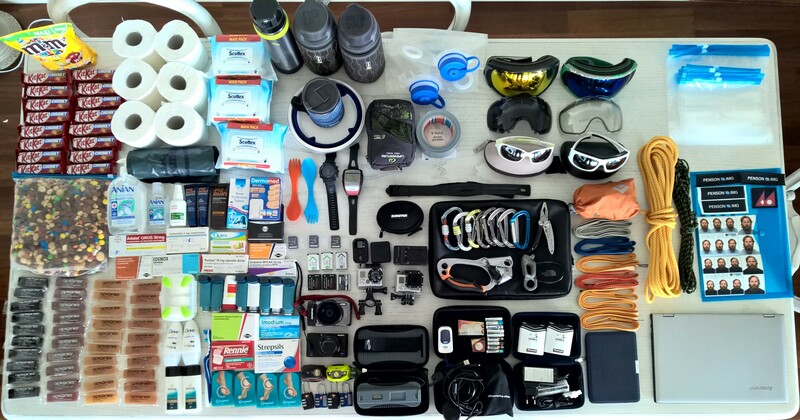 Small things including food, medication, hygiene, electronics, climbing hardware, vision and documentation. 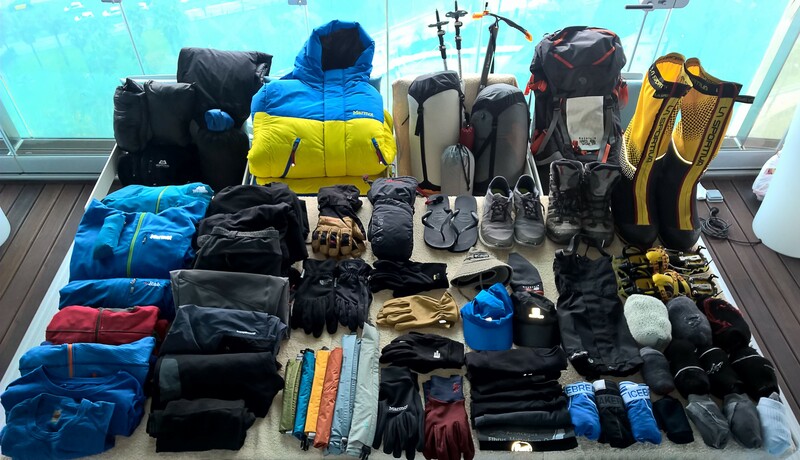 This photo contains all the larger items such as clothing, sleeping materials, boots, shoes and large climbing hardware. A lot of thought (and returning of products) took place to finally settle with the gear I have selected. I like blue if you couldn’t tell…. The most important items are the Marmot 8000m down suit which will be used at the top, The La Sportiva Olympus Mons EVO High Altitude Boots, the Mountain Equipment Lhotse outer shell jacket, the Rab VaporLite Pull-0n soft shell, the Mountain Hardwear South Col 70 (thanks Paul), and two sleeping bags; one a Marmot CWM -29c and the other a Marmot Gamma -20c. Oh and one pair of tried and tested Grivel G12 Crampons which have been angle grinded down to remove all serrations from the rear spikes so they don’t get caught on ladder rungs which we will walk over when crossing crevasses in the Khumbu Icefall. Still not entirely happy with the choice of socks. I purchased five pairs of Darn Tough 5 Function Ski socks from the US as they seemed to be perfect however on every climb I been on with them, I have ended up with blisters. I raced around the city buying up a selection of the best high altitude mountaineering socks I could find and I have now ended up with a mix which is not a great way to begin such a climb. Socks are probably the most important items because if your feet are jeopardised (with cold or blisters) it can spell the end to an expedition. Fingers crossed I can make something work with what I have. Still awaiting on a couple of items to be delivered but ready to finally start inventorying and packing. I don’t need to worry about packing weight for my flights to Kathmandu too much but the flight from Kathmandu to Lukla has limitations on the luggage — 15Kgs per duffel, 2 duffels per person plus one carry on bag (which will be my back pack). I predict a stressful RyanAir-like repacking scenario trying to get the weights correct before we fly out of Kathmandu headed for the hill. This is now getting real….